Friday. Day off. Changeover Day as one daughter is departing for Boston for a long-awaited concert trip and only son is returning from camp for the weekend. My first delight of the day, before baking, was watching some little birds expertly picking caterpillars off my kale plants. They were very thorough, enjoying their feast and saving me a lot of work. I take notice of the birds a lot more here than I ever did before. Maybe it is because more visit our garden here than in England, maybe it’s because there are more colourful ones, maybe it’s because I know people who have taught me a bit more about them or maybe what one daughter said is true, ‘When people get old they like to watch birds.’ Hmmm. Anyway onto my first technical challenge. On the Bake Off two nights ago the theme was cake. 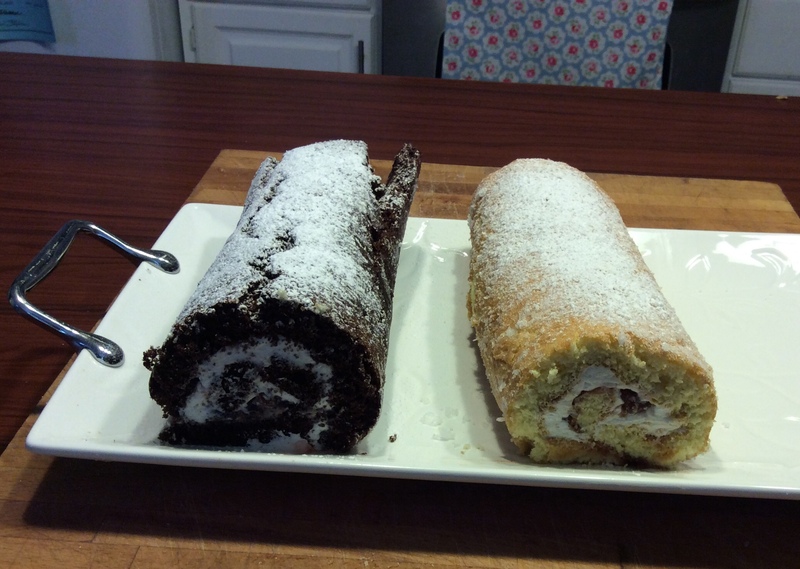 The three challenges were a Swiss Roll signature challenge where the bakers each made their own recipe of swiss roll, then the technical challenge was Mary Berry’s Cherry Cake and finally, their showstopper was to each make 36 mini classic British cakes. It was all very mouth-watering. Unbelievably I had all the ingredients in the house to make the Cherry Cake so that’s what I was doing second thing this morning. Glancing down the ingredients my heart sunk a little when the recipe called for self-raising flour. It is a little tricky to convert a British cake recipe to use all-purpose flour. I have to take an educated guess as to how much baking powder or bicarb/baking soda to add. Plus, once I’ve done it I rarely write down what I did for next time I make the recipe, because I think I’ll remember. I don’t, so I have to guess again. This time I guessed two teaspoons of baking powder – I think I could have done with a little less. Of course it’s not quite the same doing the technical challenge at home as on the show. The bakers don’t have all the instructions, just the ingredients. 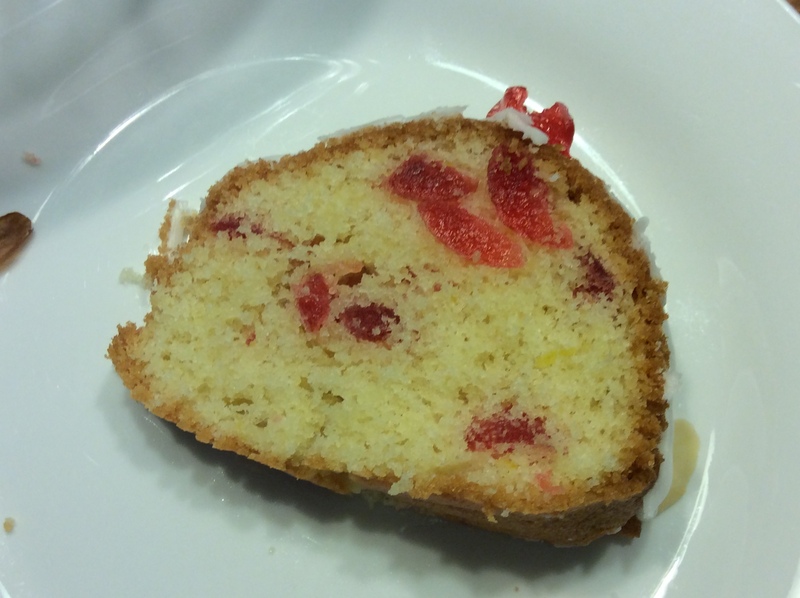 I had Mary Berry’s tips in front of me…to chop, wash, dry and toss the cherries in flour before adding them to the batter so they don’t sink to the bottom of the cake. So my cherries were pretty ‘well distributed’ as the judges would say. It tastes good I think. 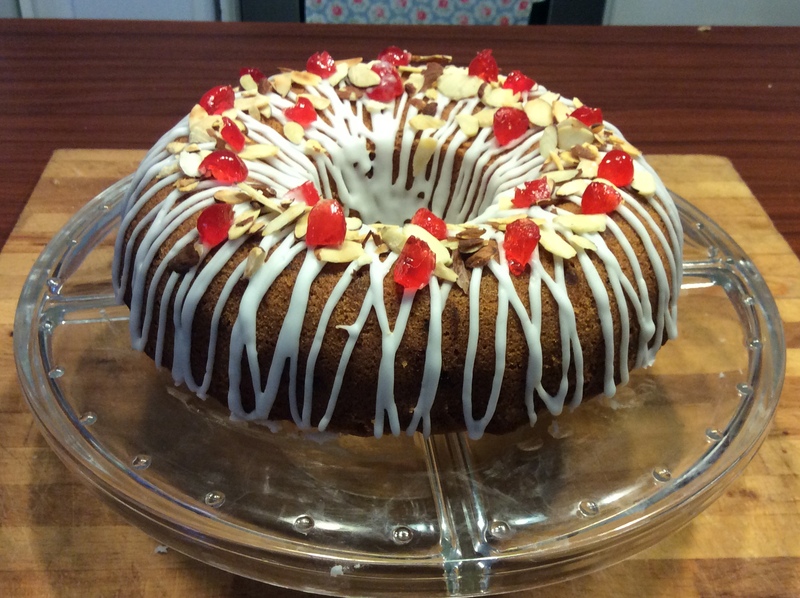 I love the little hint of lemon in the cake, it goes well with the cherries and almonds. Having said that, guess what everyone chose to have a slice of first, and is almost finished at time of writing…it could only be chocolate. Previous Post Ready! Set! Bake! Thanks Chloe…yes, it will get harder, pastry week is usually tricky! Good luck with your bakes! Emma, that so took me back to 1964. School fete, baking competition. Yes cherry cake. I was 14 and the home economics teacher persuaded me to enter. I got 2nd prize, against the local baker I was very pleased. Both Fiona and Heather bake. Heather for a living Fiona for fun. I love your site. Good to hear from you Wendy and, and good to hear about Fiona and Heather too. Apart from cherries in fruit cake, this was my first time making a cherry cake! So glad that you like the site.